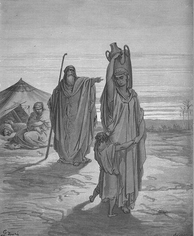 Ishmael (Hebrew: יִשְׁמָעֵאל, Arabic: إسماعيلإ‎ ʾIsmāʿīl) was the first son of Abraham and Hagar, an Egyptian servant. He and his mother had settled in the valley and was the meeting of Jurhum, nomads of Yemen and descendants of Joktan who had also spotted the water source and incorporate. He is the father of the North Arabs (Adnanites). It was derived from Abraham, descendant of Arpachshad, son of Shem, son of Noah, grand-son of Methuselah and coming from line of Seth, son of Adam and Eve, first human. Ishmael Facts for Kids. Kiddle Encyclopedia.